Day 1 of San Diego Comic-Con, 2011. If you don't have some reaction to San Diego Comic-Con International you're not participating in popular culture. What began more than four decades ago as an intimate gathering of comic book creators, fans and legends has become a packed entertainment event. Although it doesn’t have the same ring to it, Comic-Con could more appropriately be called the Transmedia Pop Culture Con where buzz for a year’s worth of projects is created, prolonged or squelched. Seated at a conference table at the McGraw-Hill building in Manhattan, Salkowitz delved deep into his nerd-business theories. A futurist and business writer, Salkowitz approaches "The Con,' as it is known in nerdy circles, as more than just a meeting ground of Hollywood suits and 130,000 fans. Instead, he calls it a “laboratory in which the global future of media is unspooling in real time,” where people participate in their entertainment instead of just consuming it. 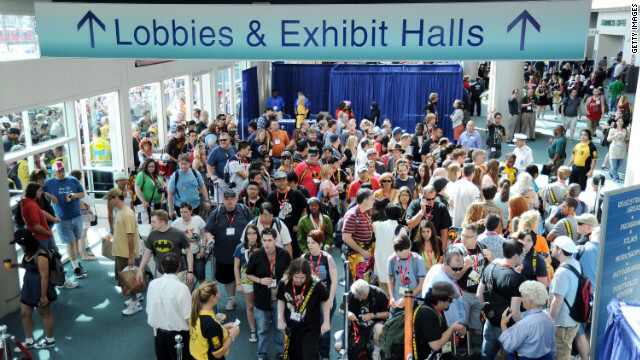 Salkowitz writes that Comic-Con can actually teach some important lessons about challenges facing all creative endeavors in our globalized, digital world, but he does so from the perspective of a comics nerd who attended his first con when he was eight. “In fact, I learned to read and write from comics, and I learned, basically, the fundamentals, of visual communication,” said Salkowitz. He strayed from the church of comics for a time as an adult, but returned to it and attended his first San Diego Comic-Con in ’97. After he ended up in a game of Five Card Nancy (based on the Ernie Bushmiller strip, and created by Scott McCloud) with McCloud, Kurt Busiek and Will Eisner, you could say he was back in the congregation.